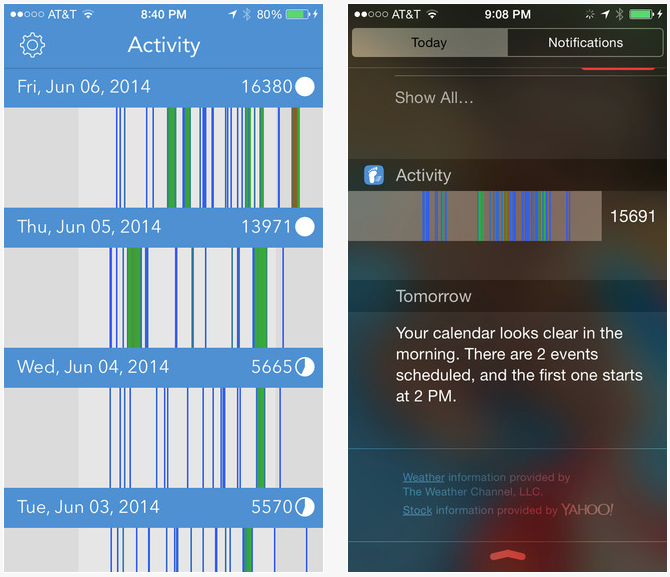 What sets Activity apart from similar step tracking apps is the way it shows the data, which is displayed for each day as an activity barcode. The barcode is color coded so you can easily identify the intensity of your activity. Blue and green bars represent moderate pace activity, while red and yellow represent a faster pace activity. Not only this lets you quickly visualize when you were active during the day, but it also lets you see patterns when looking at your activity history. Activity allows you to get a more granular view of your activity too. Tap and hold your finger on the activity barcode, and the time this activity was recorded will show. You can also drag your finger left and right to see the cumulative amount of steps that were recorded during that day. While not very pretty to look at, the data displayed paints an accurate picture of your daily activity and allows you to detect patterns that may help you figure out when you should try to be more active (or not). Activity comes with a widget that lets you see you activity directly from the Today tab in Notification Center. Again, it’s not really pretty, but it does a great job at letting you visualize your daily activity. Activity by LogYourRun is $0.99 in the App Store. Because it requires an M7 or M8 coprocessor, you will need an iPhone 5s or an iPhone 6 to run this app.